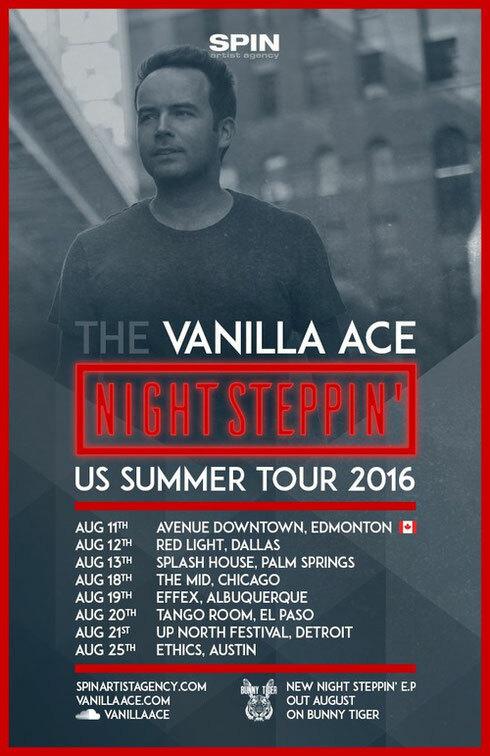 Night Bass, Enormous Tunes and d:vision artist Vanilla Ace embarks on a eight date tour of the US this August, with stops in Detroit, Chicago and Dallas as well one in Edmonton, Canada. Hailing from London, UK, Vanilla Ace has been DJing since he was 17 years old, growing up on hip-hop, D&B and house music. His very first releases were picked up by UK labels Toolroom, Southern Fried and MODA, while the following years saw him get top charting singles on Beatport and Traxsource. His ‘Musicology’ EP on OFF recordings has apparently received acclaim from bloggers, DJs and fans alike, with the ‘Bring it Back’ track spending seven weeks in the Beatport Deep House top 10 with support from the likes of Pete Tong, Tiesto and Seth Troxler. To coincide with the release of his ‘Night Steppin’ EP’ on Sharam Jey’s Bunny Tiger Records, he is hitting North America from 11 – 25 August, bring his blend of club-ready house music to some of the US and Canada’s underground venues and festivals. Previous tours have seen Vanilla Ace hit North America, Brazil, Australia, South Africa and India, with bookings including HARD Summer festival in LA, Holy Ship in Miami, Green Valley in Brazil, Egg in London and Chinese Laundry in Sydney, Australia playing alongside the likes of Amine Edge & Dance, Shiba San, Patrick Topping, Roger Sanchez and Breach. Don’t miss this opportunity to catch one of the world’s premiere house DJs in action. ‘Night Steppin’ EP’ is out 8 August on Bunny Tiger.